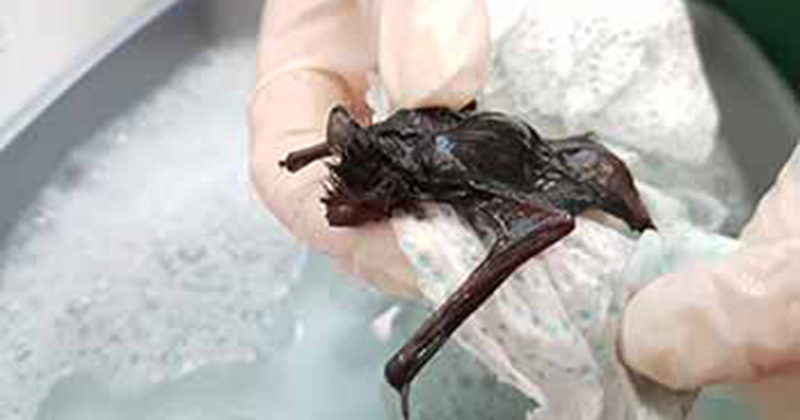 Vets used an unusual technique to rescue a tiny 5g bat after it became caught on fly paper – helping to avoid what could have been a very sticky ending. The little bat was rushed to a surgery run by British charity the RSPCA – the Royal Society for the Prevention of Cruelty to Animals – last month where rescue workers quickly acted to help save the small guy’s life. Staff at the wildlife centre in Taunton, Somerset, England, removed the paper, fed him fluids and put him under a heat lamp before giving the bat something he had probably never had before. He was given a soak in a tiny ‘bubble bath’ – made of washing up liquid and warm water, which helped to remove the glue. Bel Deering, manager at West Hatch, said: “The poor little pipistrelle bat was fed electrolytes orally and put under a heat lamp. After he had stabilised he was given a warm bath to remove the glue. “He seems to be better for having a bath as he is now eating well and can be quite feisty when he takes mealworms from the tweezers! We are hoping to move him to a special enclosure – a flexarium – over the next couple of days so he can build up his flying strength again before he is released into the wild. “This bat had a lucky escape because it does not always turn out this way. If he had been left there then he would have died a slow death from dehydration, starvation or exhaustion. We see so many different species caught on fly paper and glue traps – from bats to swallows, pigeons and starlings. At Newsner, we love animals and believe in treating them with utmost respect. Please like our page if you do, too.